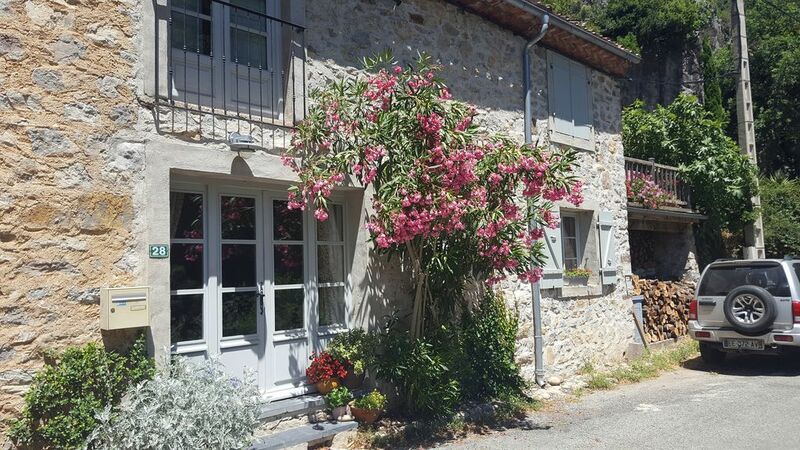 This rural Roquebrun property is st in the quiet part of the village. Originally an old stone stable, this unique property was professionally restored and extended ten years ago and now offers extremely comfortable accommodation for four persons in a blissfully calm location - yet only five minutes walk from the village ammenities. There is a lovely garden, packed with indiginous plants with a choice of two large terraces to relax on and which backs on to the wild garrigue, making it a great spot for bird-watchers. The ground floor which is tiled in handmade terracotta throughout, consists of a living room with comfortable seating for four, a fine wood-burning stove, large coffee table and television (English channels available), a fully-fitted kitchen with walk-in larder and dining area for four. On the first floor, there are two double bedrooms: one en suite with a large shower, a further bathroom and an oak-floored landing with an airing cupboard housing a washing machine and leading to the garden. The property sits on an area of patrimonial interest and the restoration was carried out in a traditional manner which reflects this. Windows, doors and shutters are painted a subtle blue-grey, and the main structural beams are exposed. There is full double glazing and central heating. Parking, is simply not a problem where we are - a major factor for a relaxed vacation. I run the property for Bob and Barbara ( the owners) as they are usually very busy enjoying village life and entertaining friends. They do usually pop in to see guests though if they are in Roquebrun during your visit. I have lived in a hamlet of Roquebrun for 10years and love this area. It's in a quiet part of the village so perfect for involving yourself in village life but being abe to get away when you want piece and quiet. There are neighbours but life on this side of the village is restful. Parking directly outside the house for 2 cars. Open all year round to guests for cosy winter breaks as well as lovely summer sun. toilet, combination tub/shower, can be used for the second bedroom only if required. There is a river beach in Roquebrun not far from the property where you can swim and have a BBQ watching the tower light up at night. Voted one of the prettiest vilage in France, situated on the River Orb with a homely rural feel. There are a 3 restaurants , tobacconist serving snacks, library, Bakers, shop. Post office, Activities. bed linen provided with 4 pillows per bed. 1 bath towel and 1 hand towel per person plus tea towels. Dining table with 4 chairs situated in the kitchen with pretty views. High chair can be requested. Perfect for a couple or 2 couples holidaying together. Great walking and cycling in the area. Kayaking from Roquebrun, pedalos and "Trottinets" - electric scooters through the vineyards and mountains.